Apartment next to Plaza Mayor and Barrio Noble. It consists of two bedrooms, living room with kitchenette and bathroom. With air conditioning hot / cold. Comfortable and spacious. Ideal for temporary or holiday stays. 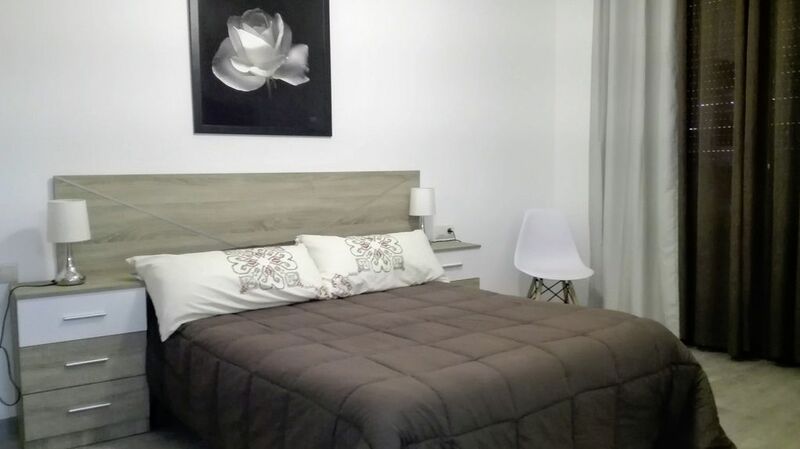 The apartment is in the center of Almagro, next to its Plaza Mayor, the nerve center of the city, where the Corral de Comedias, the National Theater Museum, the Lace Museum, the Town Hall, the church of San Agustín and the of bars, restaurants and shops. Although the area is quiet. It is located on the first floor of a building of three, without elevator, with two patios. Free parking in the immediate vicinity. From the apartment you can reach in a few minutes walking to all the places of interest of Almagro. - Municipal Theater, San Juan Hospital, Contemporary Art Space, Old Renaissance University, Warehouse of the Fúcares, Church of San Bartolomé, Church of Madre de Dios, Church of San Blás, five minutes away. - Convent of the Assumption (Dominicos), Bus Station, less than ten minutes. - Train station ten minutes away. Emilio el dueño es muy amable, atento y educado. El apartamento es muy cómodo y completo. Muchas gracias. Siempre intentamos que nuestros huéspedes se encuentren lo mejor posible. We are next to the Plaza Mayor, National Parador, banks and boxes, Market, Miguel de Cervantes School, shops of all kinds, bars, gardens, churches and Health Center. From the apartments you can reach, in a few minutes, on foot, all the places of interest of Almagro. - Municipal Theater, San Juan Hospital, Contemporary Art Space, Old Renaissance University, Palace of the Fúcares, Church of San Bartolomé, Church of Madre de Dios, Church of San Blás, five minutes away. Guía de la casa. Agua caliente por termo eléctrico ubicado en la cocina, solo hay que encender. Procuraré tenerlo encendido a su llegada. Aire acondicionado frío/calor con mando a distancia. Encender y seleccionar. Calefacción por caldera de gasóleo. Solo encender mediante interruptor en dormitorio y elegir temperatura mediante termostato en el mismo dormitorio.